Winter is not known for its abundance of produce, but that doesn't mean you can't have vibrant colors and flavors on your dining table or in your lunchbox. Spring is on its way, but it's not here yet. Not time to celebrate the next season, but it IS time to celebrate Sunday Supper hosted this week by Cindy of Recipes And Writings! Don't forget to scroll to the bottom and get some inspiration for your root vegetable cravings. There's a lot of creativity on the list! I generally don't make salads on the blog. Salads are a personal preference and generally uninspiring. I made this salad because it's really just a bunch of hot root veg that has been tossed in a simple vinaigrette. It's foolproof. The vinaigrette soaks into the vegetables and provides a little bit of sweet, a little bit of tang and a whole lot of room for additions to make this simple recipe your own. I mean, that's why we go to salad bars: to put what we want on it and make it our own! I added my Gingerbread Croutons to this bad boy and laid it on a bed of fresh kale, just for show. What's your favorite thing to add to salad? 2. Toss all ingredients for roasted root vegetable salad together and place on a sheet pan covered with aluminum foil or parchment paper. 3. Roast for 30-40 minutes. 4. Toss with prepared cranberry vinaigrette (see recipe below). Serve. 1. In a large bowl, whisk together cranberry sauce, vinegar and mustard. 2. Slowly drizzle olive oil into the cranberry mixture while whisking constantly, to create an emulsion. 3. Season with sea salt and freshly ground black pepper. 4. Stir in the chopped parsley. 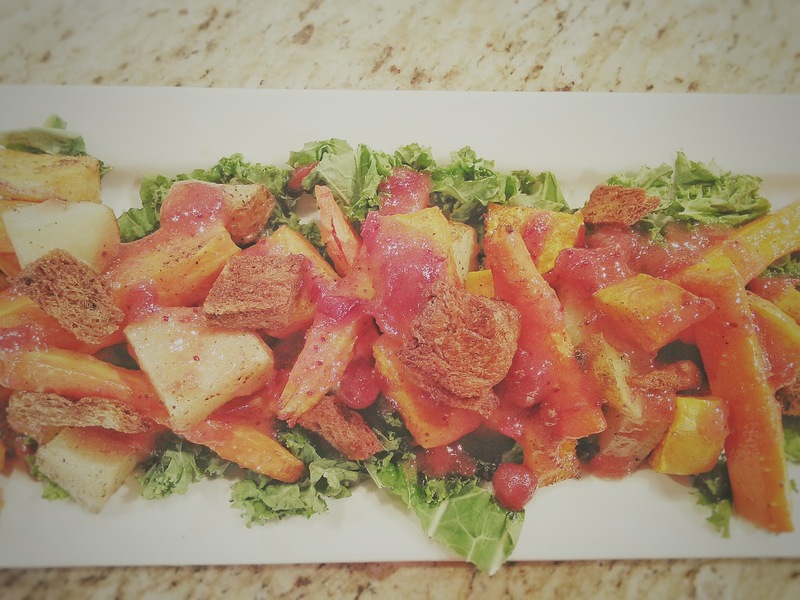 Pour over Roasted Root Vegetable Salad. Serve. I love this idea for a winter salad!! You're right - gotta start that New Year off on the right foot! 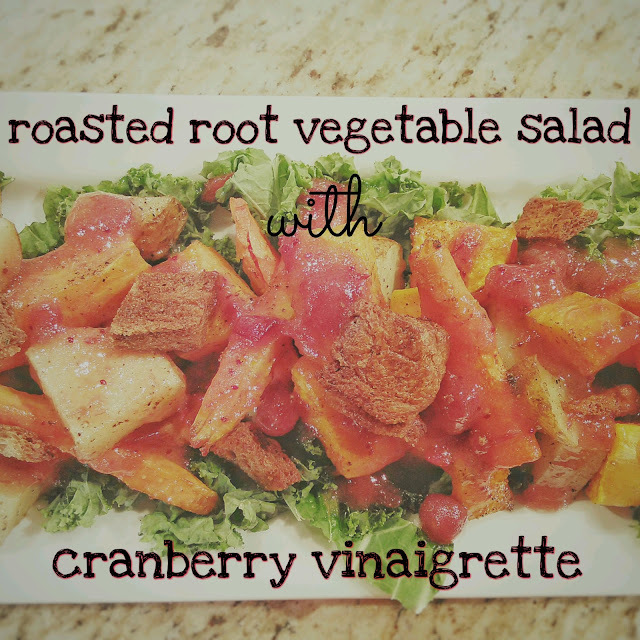 I love roasted root vegetables, great idea to add them in a salad and I love the sound of those gingerbread croutons! Nikki, your salad looks terrific! 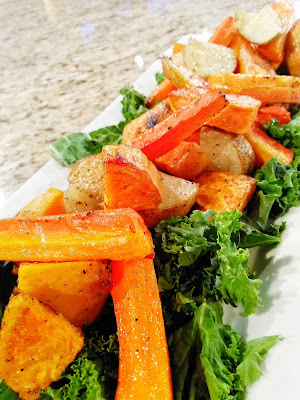 All those sweet roasted veggies are tempting me big time!!! This vinaigrette sounds amazing. Thanks! What a great winter salad! Well I adore salads and eat them every day so keep em coming! ;) I love the cranberry dressing! That cranberry vinaigrette sounds absolutely amazing! This cranberry vinaigrette looks perfect with the roasted vegetables. And gingerbread croutons??!! I've got to make some of those!! I love this salad! Great idea for the croutons too - and I dont even LIKE croutons! 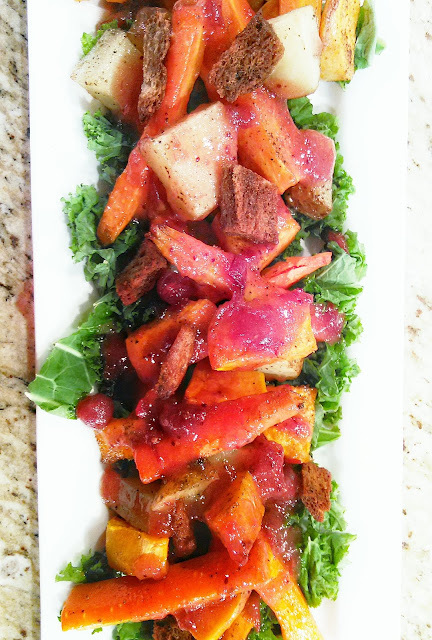 There is nothing better than roasted root veggies and I can almost taste that cranberry vinaigrette! I love root veggie salads. They're so hearty and full of amazing flavor. The vinaigrette sounds just perfect! Salad Making with decoration is actually an art. In fact decorated Salad can be inspired anyone who loves to art.